Vertical centerline treatments provide a sense of friction and can narrow lane width through the use of longitudinal channelizers. Vertical centerline treatment (Shauna Hallmark et al./Institute for Transportation). Vertical centerline treatments provide a sense of friction and can narrow lane width through the use of longitudinal channelizers. Depending on where channelizers are used, they may be between 18 and 36 inches tall, spaced roughly 3 feet apart, and be yellow or orange in color. Channelizers have been used in workzones, high-occupancy vehicle (HOV) lanes, and on ramp exits. Special considerations must be taken when large trucks or farm equipment are present, because channelizers may restrict movements. Other vertical centerline treatments include use of raised pavement markings or raised curbing. The ability of longitudinal channelizers to reduce speeds is not well documented. The majority of research regarding these devices pertains to their use at highway-railroad grade crossings. The North Carolina DOT (NCDOT), for instance, placed the delineators along the centerline of the roadway extending about 100 feet from the railroad gates to dissuade drivers from going around the gates. Afterward, they found the delineators reduced violations by 77 percent (ATSSA 2006). Longitudinal channelizers were used to create a center median as part of a rural traffic calming project (Hallmark et al. 2007) with reductions of up to 3.0 miles per hour (mph) in mean speed and 3 mph in 85th percentile speed. No crash modification factors (CMFs) were found relating to longitudinal channelizers. 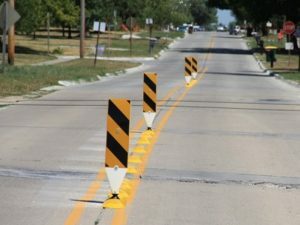 Vertical centerline treatments are not appropriate for all situations but could be used to give drivers the perception of lane narrowing when entering a town. Longitudinal channelizers, raised pavement markings, and temporary curbing are a low-cost option for narrowing lanes. ATSSA. Low Cost Local Road Safety Solutions. American Traffic Safety Services Association, Fredericksburg, VA, 2006.